May 11, 2010 - The U.S. Department of Transportation (DOT) on Monday assessed a civil penalty against Continental Airlines for filing incomplete reports with the Department tabulating complaints that passengers with disabilities registered with the carrier. Continental was ordered to cease and desist from further violations and assessed a civil penalty of $100,000. “Protecting the rights of airline passengers with disabilities is one of our highest priorities, and we will continue to take enforcement action when our disability rules are violated,” said U.S. Transportation Secretary Ray LaHood. DOT rules require airlines to record disability-related complaints, categorize them by the type of disability and nature of the complaint, and submit an annual report on these complaints to the Department. If a single piece of consumer correspondence covers more than one issue, each issue must be counted as a separate complaint. 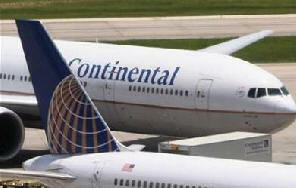 During an on-site inspection at Continental’s headquarters, the Department’s Aviation Enforcement Office discovered that the carrier had a policy of recording only the most significant issue in each disability complaint, even though many of the complaints involved more than one disability-related issue. Continental did so even though all carriers had been advised earlier that each disability-related issue raised in complaint letters must be individually tabulated. The Air Carrier Access Act (ACAA, 49 U.S.C. 41705) prohibits discriminatory treatment of persons with disabilities in air transportation. The Wendell H. Ford Aviation Investment and Reform Act for the 21st Century (AIR-21; Public Law 106-181) requires, among other things, that the Secretary of Transportation “regularly review all complaints received by air carriers alleging discrimination on the basis of disability” and “report annually to Congress on the results of such review.” This is the fifth such annual report to Congress, which covers disability-related complaints that U.S. and foreign passenger air carriers operating to, from, and within the U.S. received during the 2008 calendar year, as reported to the U.S. Department of Transportation (Department or DOT) by those carriers. This report has two components: (1) a summary of the data reported to the Department by U.S. and foreign air carriers; and (2) a detailed breakdown of the data for each carrier. To allow readers to find areas of interest easily and grasp the essence of an issue quickly, this annual report employs a graphic-intensive format for its data presentation. The 2010 report to Congress covering disability-related complaints carriers received during the 2009 calendar year will follow this same format.